Dr. Hakim Nargish Marjhan is the Director, Human Resource Development & Mutawalli, who is familiar with all the best HR practices and policies, and knows how to effectively apply them in the workplace. 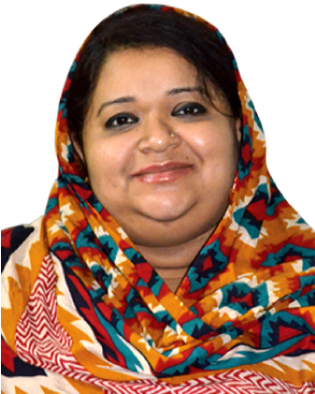 She is a promising director of Hamdard Laboratories (Waqf) Bangladesh. She has passed MBBS on 2002. She has also obtained Diploma in Unani Medicine & Surgery (Gold Medalist). She has a vast experience of working as physician in different renowned hospitals of Bangladesh. Dr. Marjhan is an accomplished and driven professional with an entrepreneurial spirit and unmatched drive. She possesses a proven ability to contribute to the organization at both strategic and operational level when delivering people management strategies. She believes that employees perform better when they understand the goals of an organization, and goes out of her way to explain the bigger picture to everyone she meets. She is an expert at using her people management skills to drive performance and attract the most qualified employees. As a true professional she is constantly looking for ways to improve how she works both individually and collectively. With her present employer she is responsible for keeping staff committed to the organization, and at the same time boosting their job satisfaction levels.